I came across this article from Steve Sricker, one of the PGA tours most consistent short game technicians recently and thought I should post it. I use this style myself with great success on the LPGA tour for many years both in the USA and playing in Europe. Since retiring from tour competition I try to pass on my experience to my students and have taught this method with lots of success. (1) Because it’s not a big swing, you can wear a heavy jacket and not feel too restricted. (2) If you get good at chipping off frozen turf, you’ll be really good off lush grass after everything thaws. Most pros hinge their wrists abruptly in the backswing on a chip shot to generate clubhead speed and create backspin. But I’ve found that my “dead-hands” approach, with very little wrist hinge, gives me more consistency. The ball doesn’t stop as quickly, but I can always count on it behaving the same way. 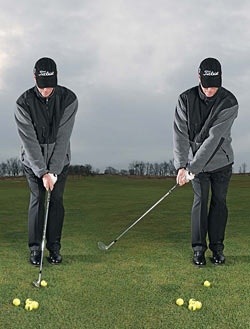 Plus, the swing is simpler and easier to repeat, so I recommend it to amateurs. At address, set your weight favoring your left side and lean the shaft slightly forward (that’s all the wrist hinge you’ll need). Then take the club back with your shoulders and forearms. All your hands do is hold onto the grip. The thought you want is to drag the clubhead through impact. Sometimes when amateurs have too much wrist set, their impulse is to release it on the way down and flick at the ball. With my style, the hands and wrist stay quiet. This entry was posted in fitness, golf, golf instruction, golf tips, sports and tagged chipping, golf, instruction, Steve stricker, swing. Bookmark the permalink.